General Information: As the name implies, the American dipper (Cinclus mexicanus), also formerly known as the “Water Ouzel”, is characterized by its dipping movements. The American dipper is a stocky dark grey bird with a head sometimes tinged brown and distinctive white feathers on the eyelids that cause the eyes to flash white as the bird blinks. 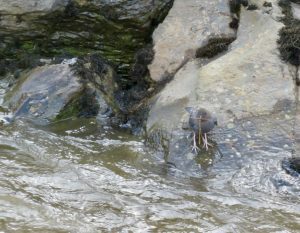 It has long legs, and bobs its whole body up and down while perched on a rock in or near a stream. 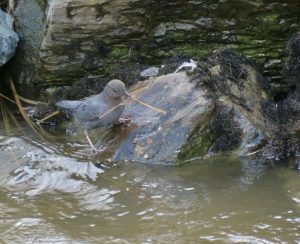 The American Dipper’s habit of ‘dipping’ or bobbing up and down while perched on a rock or ledge is not well understood though some believe the action of dipping may help them spot prey beneath the surface of the water or help conceal their image from predators. Dipping may also be a form of visual communication between birds in the noisy environment they favor – clear, clean, fast-moving streams. The American dipper is of the Order, PASSERIFORMES; Family, Dipper (Cinclidae). Range: The American Dipper is ‘Alaska Hardy’ — a permanent resident of the Kenai Peninsula, but also able to tolerate winters even in the Brooks Range and Seward Peninsula. Now that’s cold. The American Dipper is North America’s only aquatic songbird, and one of five species of dipper in the world (Europe, Northern Africa, Asia, South America, and North America). Characteristics: It is hard to mistake the American Dipper with its dependency on streams and its iconic bobbing nature. Look for a bird 5.5 to 7.9 in (14 to 20 cm) in length, and weighing in at 1.5 to 2.4 oz. (43 to 67 g). Males and females look alike, although the average body mass of males is slightly greater than females. Unlike most other songbirds, but similar to ducks, the American Dipper molts its wing and tail feathers all at once in the late summer. The bird is flightless during this time. Find a fast-moving stream, look for a stream boulder, and the probability of seeing a dipper increase as they will spend up to 10 minutes preening (preen oil glands), creating their form of wet suit – necessary for waterproofing and insulation. 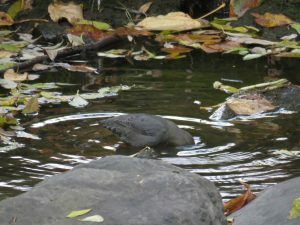 The American Dipper takes a ‘polar dip’ in the cold water with relish. It is well-adapted to its cold, underwater habitat. The American Dipper has a thick coating of down and feathers as insulation, large preen glands secreting oil to waterproof their feathers, a moveable flap over the nostrils that seals when the bird is underwater, blood cells with a large capacity for carrying oxygen, and an efficient internal system of thermoregulation. Preferred Habitat: American Dippers are stream-dependent, foraging in clear fast-moving streams with rocky bottoms. They prefer unpolluted waters, and can be found in mountain, coastal, or even desert streams. Breeding: Dippers are fiercely territorial, vigorously defending their linear stream-dependent nesting territory from other pairs. They are mainly monogamous and in most cases return to the same nest year after year. The American Dipper breeds along swift, rocky streams, seeming to favor clear, cold water, often in narrow canyons. Seem repetitive…Guess you have the picture now about stream preference. The courtship display may have either the male or female strutting and singing in front of the other bird, with wings drooping and bill pointed up. The pair may then conduct a ‘flight chase’ with complex aerial maneuvers, all the while singing. Though some pairs stay together in winter, the dipper is generally a solitary bird; after the chicks’ fledge, parents often divide their brood and their territory and part ways. Nesting: The nest, probably built by the female, is a volleyball-sized shell of moss, with an inner saucer of dry grass on which 4-5 white eggs are laid. 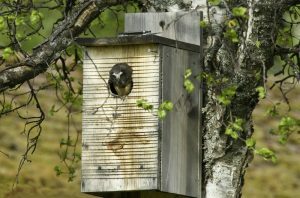 In Alaska, nest building usually begins in April or May, though cold weather and high altitudes may result in delayed nesting. Nest sites include a slight ledge on a mossy rock wall just above stream, among roots on a dirt bank, or behind a waterfall. The nest is often placed where it remains continuously wet from flying spray. Many dippers commonly select nest sites under bridges – an adaptable bird. Good nest sites seem to be the main limiting factor for the presence of a population of dippers. So if you see a bridge near a fast moving stream and you can look under the bridge, check for a dipper nest. The clutch is incubated for 2 to 2.5 weeks. Females do all the incubation, but males bring food to the incubating female. The female will brood the chicks for a week or more while the chicks grow feathers to help regulate their body temperature. Both parents feed the chicks, bringing insects and small fish – feeding the hungry brood as many as 20 times an hour. One would think the parents would be worn out after all that activity, but second broods have been recorded. Fledging: When born, the chicks are helpless with sparse down, but are ready to leave the nest in about 24-25 days. 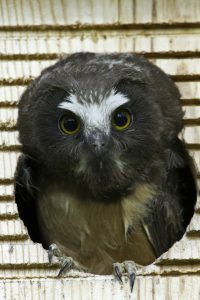 The young are fed by both parents for another two weeks after fledging, as they gradually learn how to find and catch their own prey. Chicks are able to swim and dive after fledging. 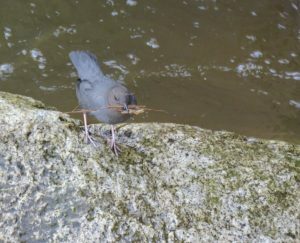 Food Preferences: The American Dipper feeds on aquatic insects and their larvae (yay! mosquitoes) and may also eat fish eggs and very small fish (less than 3″ long). 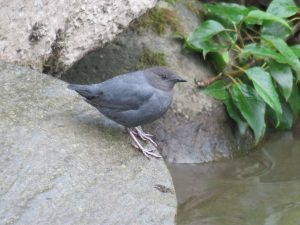 Feeding Methodology: The American Dipper can wade, swim, and dive from either the water or the air and are capable of moving underwater rocks on the stream bed to get food. The American Dipper uses its short, stubby wings to ‘fly’ underwater with powerful strokes of their partially folded wings when chasing prey. They can take prey from the water’s surface while swimming or from mid-air while in flight, but most food is taken underwater. 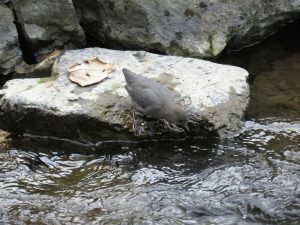 With its long legs and strong toes, the American Dipper is an underwater marvel; easily able to negotiate along the bottom of fast-moving, rocky streams in current capable of knocking over you or I.
Roosting: A variety of sites on the ground adjacent to streams are used for nocturnal roosts. Migration: The American Dipper is not a long-distant migrant so it is a ‘Homer Bird’ — a permanent resident of the Kenai Peninsula; but it may move to other locations if necessary to find food or unfrozen water. Vocalizations: The song consists of high whistles or trills peee peee pijur pijur repeated a few times. The song has also been described as a loud, bubbling song. Whatever you interpret, you will hear the dipper as the song carries over the noise of stream rapids. Both sexes of this bird sing year round, but are often quiet after nesting. Call: The call is a harsh, zeet-zeet-zeet. Eat and be eaten… The American Dipper eats fish eggs, but its habit of diving underwater in search of food can infrequently make it the prey of large salmonids. To see an American Dipper stay close to a stream as the dipper will be seen bobbing up and down on a rock in mid-stream, or flying low over the water, following the winding course of a stream rather than taking overland shortcuts. The American Dipper is equipped with an extra eyelid called a nictitating membrane allowing it to see underwater. 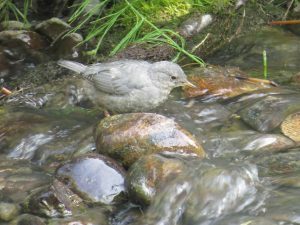 Conservation Status: American Dipper presence/absence can be an indicator of stream quality, as aquatic prey becomes scarce in polluted streams. No food, no dippers. The dipper has vanished from some locations due to pollution or increased silt load in streams. 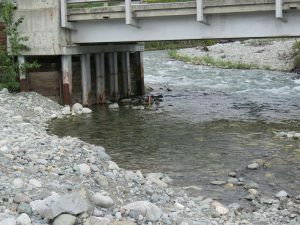 Also, sedimentation, acidification, and toxic waste from industry of various types can cause dipper reproductive failure and abandonment of a stream. The American Dipper’s population status is thought to be a species of ‘Least Concern’ by the International Union of Conservation of Nature and Natural Resources, with a stable population. The American Dipper does not appear on the Alaska Audubon Watchlist (2017). Other Dipper Species in Alaska: The American Dipper is the only dipper species in Alaska; well okay in all of North America. Audubon: Guide to North America Birds. National Audubon Society. Downloaded on 23 November 2018 at: https://www.audubon.org/field-guide/bird/american-dipper. BirdLife International. 2016. Cinclus mexicanus. The IUCN Red List of Threatened Species 2016: e.T22708163A94152063. http://dx.doi.org/10.2305/IUCN.UK.2016-3.RLTS.T22708163A94152063.en. Downloaded on 25 August 2018. Kachemak Bay Birder, B.J. Hitchcock, talks this month about bird food and feeders. She describes the various types of food you can put out to attract birds to your feeders, including sunflower seeds, nyjer, and suet. And remember, feed birds only during the winter months so you don’t unnecessarily attract other wildlife, like bears. 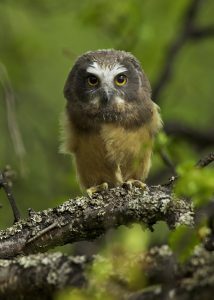 Gary Lyons introduces us to the Northern Saw-whet Owl, one of Homer’s smallest owls. 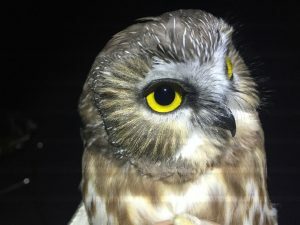 This owl is the Kachemak Bay Birder’s October Bird of the Month. Winter is a great time to feed birds, but what should you feed them? Kachemak Bay Birder B.J. Hitchcock explains the type of food for different birds, be it store bought or homemade, along with different types of feeders (article published November 21, 2018). And don’t forget that bird feeders do need to be cleaned periodically. Birds also need a source of water. General Information: Common Redpolls are common Arctic and sub-Arctic breeders. Their numbers vary from year to year (irruptions) depending upon on the availability of seed. Description: These small songbirds are members of the finch family and are about 5.25 inches in length. Females have a red or orange cap, while males have a red cap and red on the breast and sides, with distinctive black chins. The male and female have streaking of the flanks, rump, and undertail coverts and a yellow bill. Preferred Habitat: In winter, the Common Redpoll prefers open woodlands, brushy edges, weedy fields, and is a regular visitor at bird feeders. During the summer they can be found breeding in varying habitat types: edges of spruce forests, birch stands, mixed conifer and birch, willow thickets, and low tundra shrub. They avoid dense forest. Breeding Season: Breeding begins in late April in the western states, and June in the east. The female searches for the nest site and builds the nest on a horizontal branch or in the crotch of a spruce, alder, or willow. They nest low to the ground. On the tundra the nest is placed under a rock ledge, in low ground cover, or among driftwood. Nest: The nest is cup-shaped, consisting of fine twigs, grasses, and plant stems, and lined with down, feathers, and hair. In the arctic, old nests may be reused, in which case the female relines the nest. Pairs will often nest near one another in loose associations. Eggs and Incubation: Usually 4-5 eggs. Nestlings are altricial (young are unable to care for themselves when born). Female incubates the eggs 10-13 days. Young are tended by both parents. 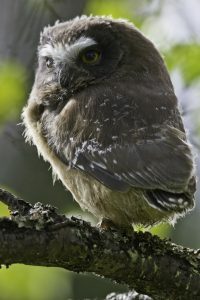 The adult pair remain together and may have from 1-3 broods in a season. That’s a lot of young ones to take care of each year. Fledging: The young quickly grow flight feathers and fledge 11-14 days after birth. Food Preferences: Common Redpolls are seed eaters, preferring a seed about the size of their bill. Birch catkins are a preferred seed source. Redpolls do come to feeders, preferring nyjer or thistle seed, but also eating black oil sunflower seed. They will also scavenge opened seeds left by other birds. Feeding Methodology: The Common Redpoll is an active communal forager generally found in flocks. Migration: During a normal year, fall migration begins in late August and extends to early December. Spring migration is from late February to early June. Birds migrate during the day and in flocks. The Common Redpoll is an irruptive migrant. They will move south irregularly in winter following patterns in food supply. 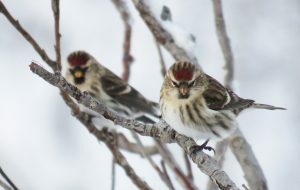 Their winter habitat is the northern boreal forest, however every couple of years, redpolls move farther south in winter, occasionally reaching the central or southern United States. Their movements generally correspond to the availability of seeds and population response to increasing numbers. Song: Combination of a trill and twittering. Threats: Climate change is transforming the Common Redpoll habitat. During a winter night, the Common Redpoll will tunnel into the snow to stay warm. These tunnels may be more than a 12 inches long and 4 inches under the snow. Brrrr. 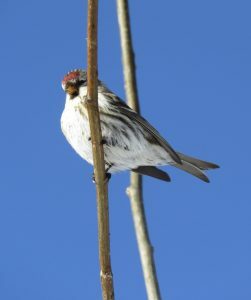 The Common Redpoll can pull a string to get to a piece of hanging food. They can shake seeds out birch catkins so the seed falls to the ground where the birds easily eat them. Redpolls have throat pouches where they temporarily store seeds to later take to a protected, warm spot to eat. Some redpolls eat a diet consisting entirely of birch seeds. Redpolls have high-energy needs and can eat up to 42% of their body mass each day. Redpolls are ‘Alaska Hardy’ and have been found to survive in areas where the temperature dips to minus 65 degrees F. That’s cold!!! A redpoll banded in Alaska was recovered in the eastern U.S. A redpoll banded in Belgium was found in China two years later. Those are long distance trips. 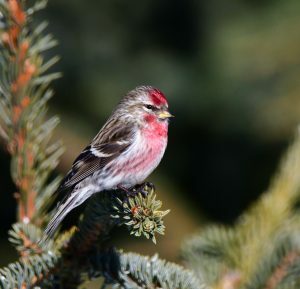 Conservation Status: Common Redpolls are species of least concern, but populations are declining. Their estimated global population is 160 million. Dunn, Jon L. and Adlerfer, Jonathan, Editors. 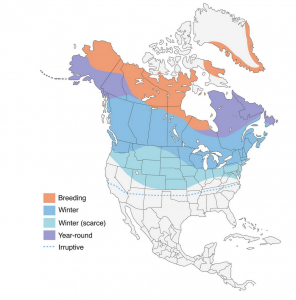 National Geographic: Field Guide to Birds of North America. Fifth Edition. 2006. The IUCN Red List of Threatened Species. Version 2018-1. <www.iucnredlist.org>. Downloaded on 19 July 2018. 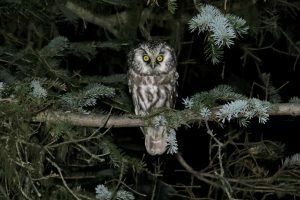 Want to know more about three owls that reside in the Homer Area? 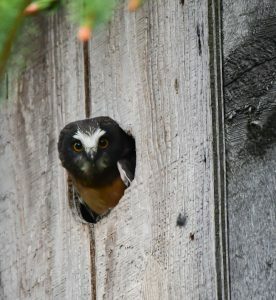 Read Kachemak Bay Birder Michelle Michaud’s article about the Great Horned, Boreal, and Northern Saw-whet Owls (published October 18, 2018). Kachemak Bay Birder Carol Harding introduces us to our largest Songbird – the Common Raven and the KBB September Bird of the Month. Learn more about this fascinating bird which makes its home year-round in Homer, Alaska. 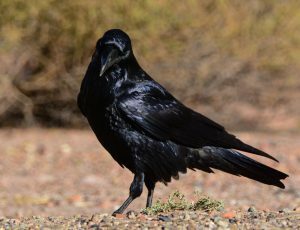 General Information: Other than commonly seen, there is nothing ‘common’ about the Common Raven – a member of the Corvidae Family, Order Passeriformes (yes a “songbird”). There are eight subspecies of Raven, with the Common Raven of Alaska sharing the Corvidae Family spotlight with the Northwestern Crow, Gray Jay, Steller’s Jay, and Black-billed Magpie of Homer. The raven is often described as the ‘Einstein of birds’—exhibiting unique problem-solving abilities and the ability to learn from observed behavior. The brain of a Common Raven is among the largest of all birds. And, as if the bird knows it is special and not common, the walk of a raven has been described as a swagger accentuated with a couple of hops as distinguished from the waddling crow. Characteristics: The Common Raven is a large bird, with glossy black feathers, a large bill, shaggy throat feathers, weighing in at 2.6 pounds, and 25 inches long – not your average Passerine song bird. Juvenile birds lack the shaggy throat feathers. They are larger than the Northwestern Crow as demonstrated in the photo below. A good way to distinguish a Common Raven from an American or Northwestern Crow is the by their wedge-shaped tails, best observed in flight. They are long-lived birds. Preferred Habitat: The Common Raven is often distinguished from the Northwestern Crow by habitat selection with the Raven preferring more open countryside areas near forested areas whereas the crow is more habituated to human presence. However, being an exceptional bird, the raven provides an exception to the rule and is often found on Homer beaches with the reward of a good food supply and open space. The Raven is adaptable to a wide variety of habitat — at home in the Alaskan Arctic, forest, grassland, and coast. 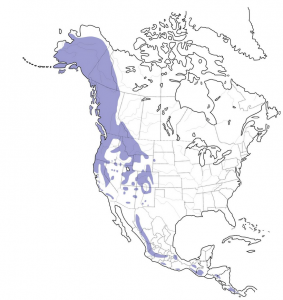 And, for you ‘snowbirds,’ the Common Raven is even found in the Southwestern, ‘lower 48’, desert. Breeding Season: Ravens mate for life. In interior Alaska, mating behavior is displayed in mid-January with nesting beginning in mid-March. 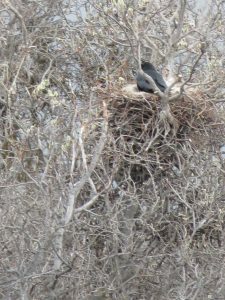 Nesting: Nests are large – essentially a pile of sticks, up to five feet in diameter and two feet in height, forming a platform of weaved sticks, and often found in the crouch of a tree or cliff overhang. The male will salvage sticks or even break off tree limbs three-foot long to contribute to the nest. The female is the interior designer making an inner cup 5-6 inches deep and 9-12 inches wide. They generally pick a new nesting area each year. Eggs and Incubation: The female lays 3-7 eggs with an incubation period of 20-25 days. The female incubates while the male brings food to the female. The pair has one brood a year. The chicks are altricial – blind and featherless, thus helpless. 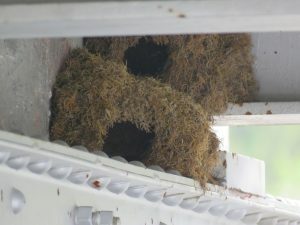 They are ‘nest-bound’ and require the care and feeding by both parents. Fledging: The chicks leave the nest about 4 weeks after hatching. The remain with the parents after they fledge. Food Preferences: The Common Raven has been described as ‘feeding on practically anything’ in its Omnivore style dietary preferences. They are opportunistic feeders. The Common Raven is often a major predator, especially taking nest eggs of seabirds. Foraging is often facilitated by a pair of Ravens as they incorporate clever methods of finding food. They will cache or hide their food, and raid other ravens’ caches. They are known to regurgitate undigestable food (think pellets). Their diet is mostly small mammals, but also berries and other fruit, grains, small invertebrates, amphibians, reptiles (outside of Alaska, of course), and birds. They will follow a predator’s tracks to a fresh kill; and will tug on the tail feathers of a raptor (such as Bald Eagle) to distract it so it can steal a bite of food. This activity has been observed on the beach at Anchor Point during the summer fishing season. Check it out next time you are there. During the non-breeding season, they may travel up to 30-40 miles from their roost site to feed. Roosting: In winter, Common Ravens may gather in flocks to forage during the day and to roost at night. During the rest of the year, they are often coupled, or in small groups. As many as 800 ravens have been seen in one roost near Fairbanks. Now that is a lot of ravens. Migration: The Common Raven is a year-round resident of Homer – well throughout its range. It has been the only bird present during the Christmas Bird Count in Barrow. Vocalizations: The Common Raven is described as a great mimic and possesses a varied repertoire of social vocalizations. One study in Alaska showed ravens have more than 30 distinct vocalizations (including mews, whistles, even dripping water sounds). The most common vocalization is deep guttural or croaking voice – it almost sounds like the Raven is talking to you, or voicing an opinion. They are talented mimics. A flock of ravens is called an “unkindness”. Ravens have been described as playful, as an active learning strategy. They are known to recognize different individuals – both ravens and humans. Juvenile ravens have been observed sliding down snowbanks and rolling in fresh snow, apparently just for fun. Ravens seem to play in the air as well – flying loops, executing rolls, dive-bombing each other. Edgar Allan Poe made the raven famous as a symbol of death. The raven is a theme in much of Native American mythology. Alaska Natives; Tlingit, Haida, Tsimshian, BellaBella, and Kwakiutl all viewed the raven as the creator of the world and bringer of daylight. The raven is also important in the creation of myths by the Eskimo. The myths of the raven remain a significant social and religious component of Alaska culture. Legend has it that if ravens leave the Tower of London the British Kingdom will fall. They were once slaughtered as pests (okay not such a “fun” fact). Juveniles do not breed until 3-4 years of age and will often help with feeding the subsequent young of their natal parents. Conservation Status: Ravens disappeared from much of the East and Midwest before 1900. In recent decades they have been expanding their range again, especially in the northeast, spreading south into formerly occupied areas. The International Union of Conservation of Nature lists the Common Raven as a species of Least Concern – trend increasing. The raven does not appear on the Alaska Audubon’s Alaska Watchlist 2017. There is an estimated 7.7 million Common Ravens. 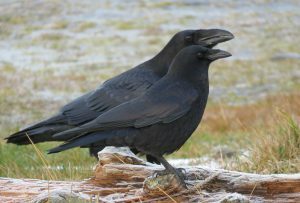 Other Raven Species in Alaska: There are no other raven species in Alaska, but other members of the corvid family here include the Northwestern Crow, Steller’s Jay, Gray Jay, and Black-billed Magpie. Marzluff, John M. and Tony Angell. 2005. In the Company of Crows and Ravens. Yale University. The IUCN Red List of Threatened Species. Version 2017-3. <www.iucnredlist.org>. Downloaded on 16 May 2018. Sibley, David Allen. 2001. The Sibley Guide to Bird Life and Behavior. Alfred A. Knopf. New York. Warnock, N. 2017. The Alaska WatchList 2017. Audubon Alaska, Anchorage, AK 99501. Downloaded on 11 April 2018.